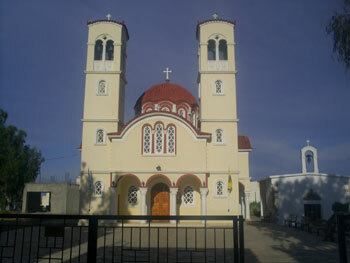 Georgioupolis, 25 km west of Rethymno, is popular with German holidaymakers. The bay contains Crete’s only freshwater lake with lots of eucalyptus trees and some stunning beaches. For families with small children, Georgioupolis is an ideal resort. 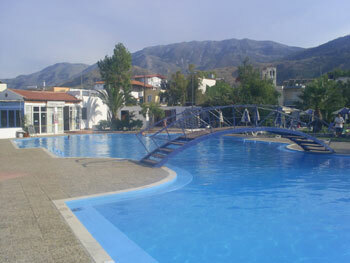 The restaurants, pensions and the huge public swimming pool here are also cheaper than in any other resort on Crete. 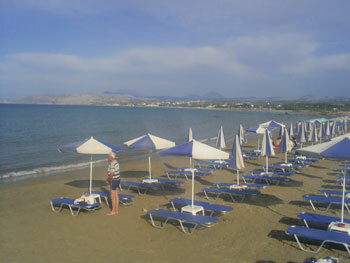 Most of the bigger, beaches in Georgioupolis have deck chairs, surfboards, water-skis and similar equipment for rent. You can rent pedal boats at the river mouth (close to the town centre), and cycle up the scenic river for miles. If you’re lucky you’ll see some sea turtles and birds like egrets. 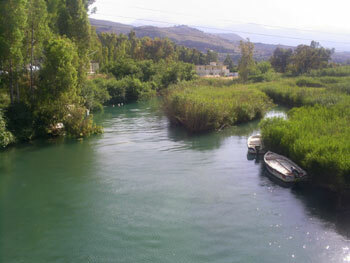 It is, however, ecologically questionable to have so much boating traffic travelling on the Almiros River. There is very little car traffic in the village of Georgioupolis. The most eye-catching of all the local buildings is the big church. In the town centre, opposite the beach is a big public swimming pool with a sizeable lawn. The entrance fee (€2 in 2007) gets you a free drink at the bar and a deck chair. From Georgioupolis there are road trains to the surrounding villages and to Lake Kournas. Accommodation in Georgioupolis: Georgioupolis caters for both package tourists and the individual traveller. Pension Anna is recommended for a budget choice. From the centre, you go over the bridge, and after 50m you’ll find Pension Anna on the left. The rooms are well furnished and quiet. In 2007 prices were €20 in season and €15 out of season. Buses in Georgioupolis: All buses stop on the main road just out of town. Buses run to Chania (50 minutes) and Rethymno (20 minutes) hourly. If you want to go to Chora Sfakia, take the bus to Chania and change buses in Vrisses. Please note that there are only four buses a day from Vrisses to Sfakia). Holidaymakers in Georgioupoulis should definitely make some time in their itinerary to visit Lake Kournas, 5km out of town. The lake is a popular spot for swimming and pedal-boating. The lake is also protected, so there are many rare animals around here, such as freshwater turtles, great white egrets, rare species of fish and non-venomous water snakes. There are some restaurants and simple rent rooms near the lake. You can get to Kournas by road train or on foot from Georgioupolis. 1 or 2 buses a day go between Rethymno, Kournas and Chania, along the old main road in both directions. Where to go on Crete?